If you are in Fort Lauderdale or South Florida beware of Ken Frankel he is THE WORST INJURY LAWYER period. A little over 2 years ago I hired Frankel in a case where I had a serious spine injury. Ken Frankel sent me to a doctor he claimed was a spine surgeon. That was FRAUD since the quack is a foot and ankle surgeon not authorized by any hospital to do spine surgery. For weeks the foot doctor a Dr. Peter Merkle mistreated me and misdiagnosed me. It was only after I kept complaining how I had loss of movement on my right side that the foot doctor ordered an MRI and damage to 8 discs were found plus a herniated disc and a spinal impingement which caused partial paralysis on my right side. At that point I began speaking to Frankel about malpractice on the doctor he sent me to and how the injury ended my career building internet portals for my trust. Before the injury I created over 300 Business and Local search portals since the injury I haven’t built one portal. So my trust has a huge loss of services action on the place I got injured in. As soon as my case went from just an injury to a case where my injury ended my tech career causing BILLIONS in damages to my Trust Ken Frankel asked to remove himself from the case since in his words he didn’t think he could get me the type of damages I was now speaking about and also his small practice didn’t have the army of lawyers my case would need to properly sue all the potential defendants (Over 600 homeowners in an affluent development I.got injured in). He also stated he was worried I would use the power of 300 plus business portals to destroy his career if his handling of my case didn’t make me happy. He also stated his skillset was fast larger settlements and not long drawn out cases with complex trials. So I was happy to get rid of a lawyer honest enough to admit a major tech career ending injury was beyond his skill set. The foot doctor didn’t heal my injury and due to intense scapula pain I can’t sit at a computer for long periods needed to do what I’ve been doing over the past 20 years building huge Internet business portals. Recently, I had a real spine surgeon treat me, the damage the foot doctor said I had was not all the damage I have. I have 11 discs damaged not 8, I have 3 herniated discs not one and I also have a torn rotator cuff. The damage Dr. Merkle who was the doctor Ken Frankel uses was only a fraction of my real damage and now I getting proper therapy so who knows maybe one day I might be able to return to portal building. It was not until recently that I found out about all my real damage that I found out Dr. Merkle is not a real spine surgeon he is only a foot and ankle surgeon who isn’t qualified to do spine surgery at one hospital in the USA. That’s why it took weeks to get MRIs of only the cervical and lumbar region of my spine and why Dr. Merkle didn’t order aa shoulder MRI or a thoracic MRI. Upon finding out Dr. Merkle used FRAUD in presenting himself to me that he was a spine surgeon I confronted Ken Frankel about the FRAUD he and his doctor used in regards to Dr. Merkle being a spine surgeon. I strongly suggest Ken Frankel make me a settlement offer or I would do what I’m doing now telling my story about the less than competent care he used in handling my serious injury case. So now Dr. Merkle is under investigation by the Florida Medical Examiners board for less than the standard of care he used in treating my injuries as well as FRAUD. I am reporting Ken Frankel to the Florida State Bar for the less than competent way he handled my injury case and the FRAUD he used in insisting Dr. Merkle is a spine surgeon who obviously misdiagnosed me and mistreated me. Had I hired a real competent injury lawyer I would of seen a real spine surgeon and had the severity of all my injuries properly diagnosed and treated. Ken Frankel has a high AVVO rating and had a high Google rating. Well now my ratings will reveal to the world why I say unequivocally now Ken Frankel is THE WORST INJURY LAWYER in Fort Lauderdale and the world IN MY OPINION. Since I’m a public figure who authored over 100 books, wrote and performed over 100 songs and produced over 20 films and documentaries from my books, I’m sure the media will pick up my story and make sure any potential clients of Ken Frankel see my story how his incompetent handling of my case was the proximate cause of me not being treated properly for over two years. So now Ken Frankel and Dr. Merkle face huge loss of services actions by my international trusts created decades ago to managed all the IP assets I created in my long tech career. A career cut short by malpractice by both Ken Frankel and Dr. Merkle. I have FREEDOM OF SPEECH RIGHTS to write stories such as this and dozens of editors have FREEDOM OF PRESS RIGHTS to cover my story. It’s ironic that Ken Frankel has an incompetent PPC Guru doing his AdWords ads. His Guru doesn’t even use negative keywords in Ken Frankels AdWords advertising. 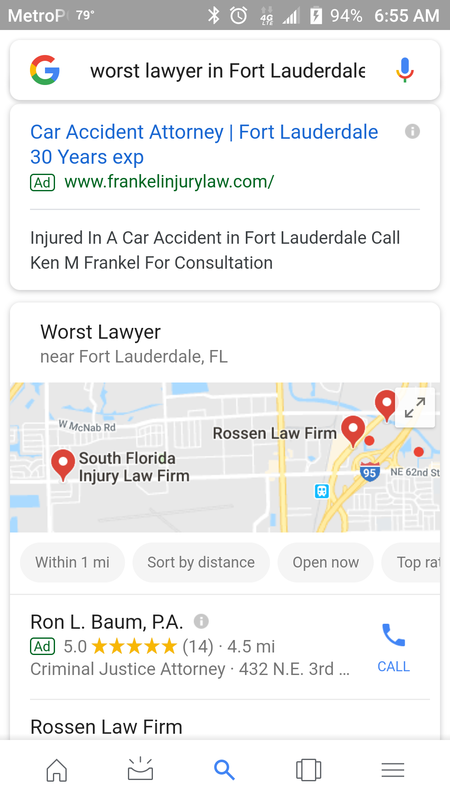 When you search for terms such as incompetent Fort Lauderdale Lawyers or worst Fort Lauderdale Lawyers you see Ken Frankel buying AdWords ads for those terms. They lead the public to an F rated website that opens in over 15 seconds. That means Ken Frankel is too cheap to use a quality hosting company. Just like Ken Frankel was too cheap to hire an investigator to go to where I was injured to take photos and videos for my case. Ken Frankel actually had me go back to where I was injured to take photos and video. That alone proves how incompetent he was in my case, real competent injury lawyers hire investigators to take photos and videos. Just like real competent injury lawyers use real spine surgeons to diagnose and properly treat severely injured spines. Say Hi to the Florida State Bar Ken Frankel and now you know I’m suing you for gross malpractice along with Dr. Merkle. Here’s some images of how incompetent Ken Frankels PPC guru is not using negative keywords on AdWords. Plus a link to his websites F rating and super slow page open speed. If your website opens over 1 second it’s too slow to use for PPC advertising. You lose 25% of potential new users at only 2 second page open speed. After 5 seconds you have lost over 90% of potential new users. At over 15 seconds page open speed a business is basically dead, no one wants that long for a website to open today. So if you have a business check what your PPC guru is doing. Is he not using negative keywords to keep your company off negative term searches? You can check your website speed and WPO grades at this link that proves how bad Ken Frankels site really is. Here’s just some of the negative keywords you find Ken Frankel buying on AdWords. I really love this parody video about all the mistakes companies make in PPC marketing on AdWords. It features all the mistakes Ken Frankel has made.